I'm designing a world with earthlike gravity where the human colonists are intended to live on top of a gigantic shield volcano as tall as Mount Everest. What would the pressure be at the bottom? Would it be too dense for humans to breathe? There are online calculators for that. However, if you assume the same density and radius of Earth, then you can simply increase the pressure by a fixed factor. The factor must be so that pressure at 8800 m (currently about 31% of normal) becomes 1 bar. Which means that it is 1/0.31 = 3.22. Multiply the pressure at sea level by that factor and you get the new sea level pressure - 3.22 bar. However, you can start with a lower pressure at height (perhaps two thirds of normal), which is easily survivable - you have that in La Paz, Bolivia - and gets you about 2 atmospheres at sea level, also survivable with next to no symptoms. This website has an atmospheric pressure calculator. Since we are assuming that everything about the planet is the same except for the modified atmosphere, plugging in -8000 meters for altitude gives me 2.39 bars of pressure. This chart from Atomic Rockets tells me maybe. 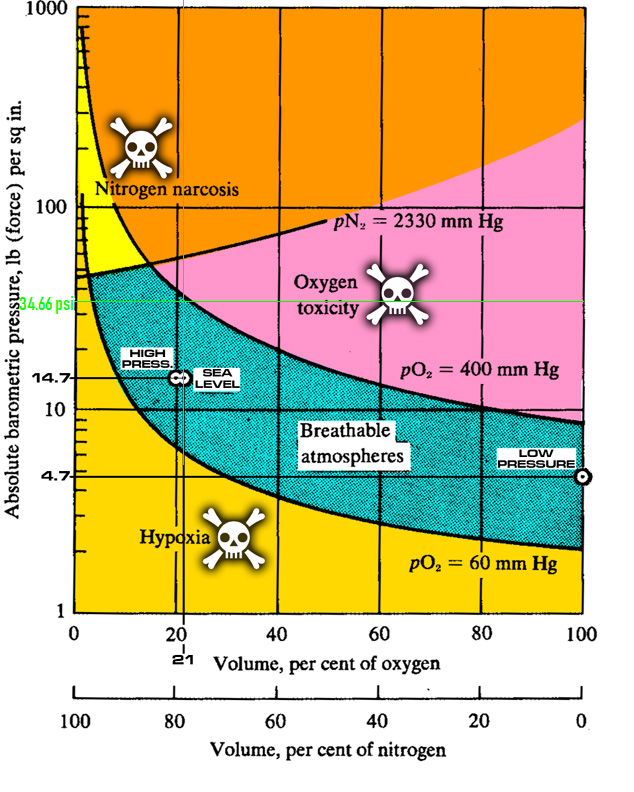 At 2.39 bars or 34.66 pounds per square inch (what the chart uses), we skirt the edge of oxygen toxicity and nitrogen narcosis. Not the answer you're looking for? Browse other questions tagged hard-science atmosphere or ask your own question. 2.5x atmospheric pressure + 25% atmospheric oxygen saturation level =?